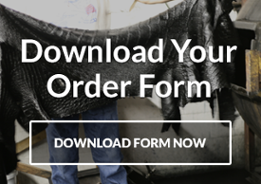 We are a custom alligator tannery for anyone with their own skins that are properly tagged and preserved. For more information on the process and some helpful hints Click Here. If you want us to color your skins, you can select colors from any of the products at Shop Pan Am Leathers. We can also dye-to-match other colors upon request, so long as you provide a TPX pantone reference number or a hard swatch for us to match. This may be subject to surcharges. We will get back to you within 24 hours with pricing and deliveries. © 2019 Pan American Leathers, Inc.